If you are familiar with Yayoi Kusama, the famous Japanese artist who works with vast fields of polka dots, you may recognise a smidgen of her influence in this highly stylised home. The home is located in Juhu, a wealthy coastal suburb of Mumbai, India. It has been dubbed Trinity and was created by the interior designers from My Beautiful Life. The curved windows blend perfectly with the built in furniture and an almost all white decor. This is a home that has been stylised right down to the finest detail. We can't quite decide if the end result is futuristic or delightfully retro. What we do know is that the space conjures up a sense of luxury, the 1960s, a scene out of the sci-fi cult classic film Barbarella or perhaps just a quirky world that is completely of its own. Come with us on a photo tour as we explore this utterly unique home. The designers wanted to create a space that was both organic and futuristic. With this in mind, they attempted to create a space with no edges and a sense of the infinity. Here in the dining room, the resulting design has a field of small organic white ceiling lamps. The spheres are reflected in the balls of the chairs and convey a distinctively retro vibe. To amp up the effect, a transparent dining table adds functionality without offering any distinctive visual edges in the space. For the final retro touch, bright splashes of tangerine orange have been added to the otherwise all white decor. Again we have the same field of white ceiling lamps and transparent furniture. But here they have added a curved glass wall and the organic shapes of the white furniture. The designers were keen to create a sense of overlapping spaces without distinct boundaries and here we can see how they have attempted to do this with the cut-out windows in the wall. As we can see in the bedroom, there are the same wall openings between the spaces. While this lack of boundaries was important, the designers also wanted to merge all three dimensions and create a space that felt like a cocoon. Here in the bedroom we have a real sense of that with the all white decor that perfectly blends all the built-in bespoke furniture into one seamless organic line. 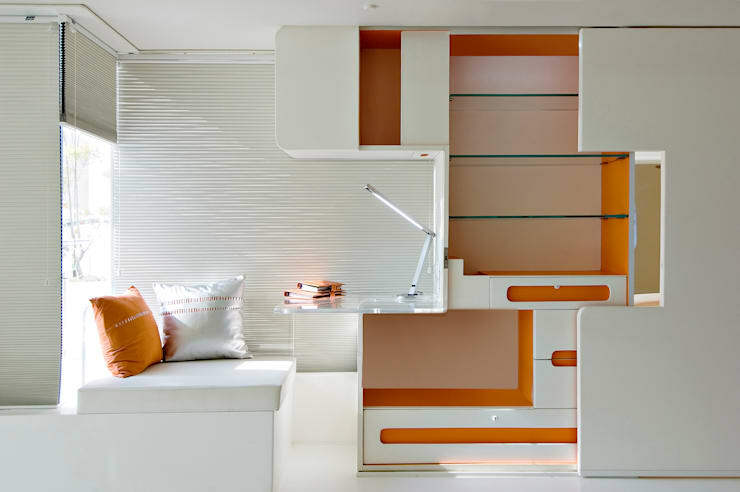 We doubt there are many bedrooms with light therapy, but here you have it! We have pink, purple, green and orange light features. 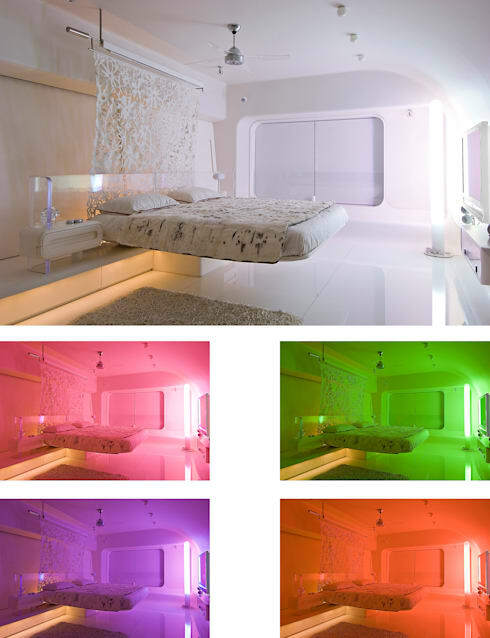 Weather your mood is playful, romantic or energetic this is a futuristic bedroom to cater for all moods. Moving through to rear of the bedroom, we have a view of the ensuite bathroom and built in wardrobe. The organic shaped construction would really blend into the rest of the white room when closed. But when open, the tangerine explosion of colour really hits you. This is one unique bedroom feature. This snug little study nook in a window seat is certainly a spot where you can just knuckle down and work. It just goes to show just how little space you need to make a small working desk space. At the same time, we can see how to clever overhead built in cabinets provide lots of storage options. The tangerine orange accents really liven up the interior. For our last photo, we'll look at the all white bathroom. 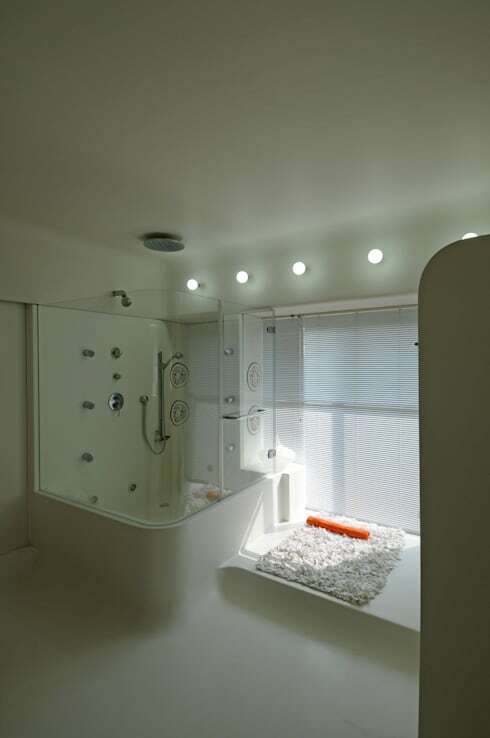 The large white shower has a glass shower cover and body massage jets for the ultimate in luxury. But what we love most about this space are the seamless finishes. Here we think the smooth organic shapes look most beautiful, particularly where the floor meets the shower. 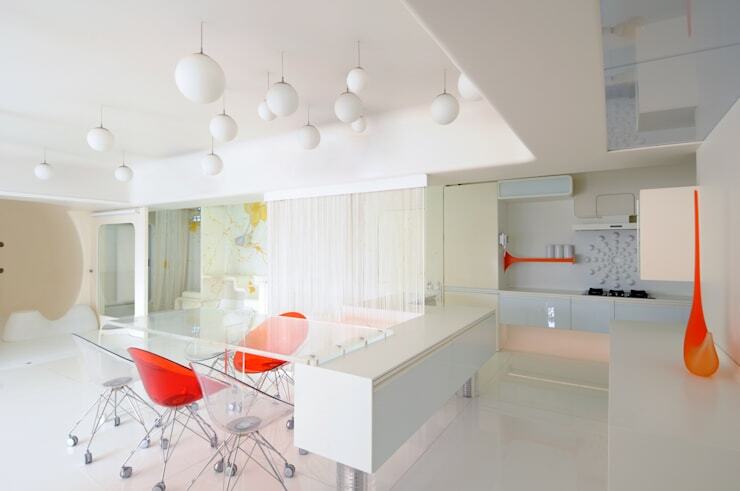 If you love retro designs, you will love this Ideabook A 60s time warp: stylish retro interiors. What do you think of this unique home? We'd love to hear in the comments below.